Don’t Miss It! Sign up for the 2nd annual Joy Run 0.5k! Joy Meadows aims to provide stability and healing for foster children by maximizing the potential of single-family foster homes. Through housing, community support, and centralized access to resources, foster parents will find the joy and longevity needed to serve foster children and maintain siblings within one family. It is the vision of Joy Meadows to provide stable, consistent, single-family homes for as many children in foster care as possible. Joy Meadows will consist of a neighborhood of large homes so that foster families who are good at what they do will have the opportunity to live in a home where space allows for additional children, particularly large sibling groups. The neighborhood will be a place where foster children can be placed initially when they come into care, rather than multiple moves. This means they receive the help and continuity of care they need to heal -- it's a place where they can look like other kids and see they aren't alone. We envision a community of foster parents who have support by providing them centralized access to resources, shared goals, assistance, respite care, and easing their financial burden. We want to build a multi-purpose building that is the center of the community where services are provided to children and families. This building will house supports such as therapy, private lessons, extra-curricular activities and will provide space for networking of foster families and each child's team. KVC, DCF, and all those involved in managing the cases for foster children will have space to work together. We want to support foster families so they do not have to experience burnout in helping these children. We want to help the foster child and foster family find joy, even as they walk through the difficult steps to healing and home. Find out about our organization, mission, our model, and our goals. Sign up for our monthly newsletter to stay up to date on our progress and goals. Sign Up Here. 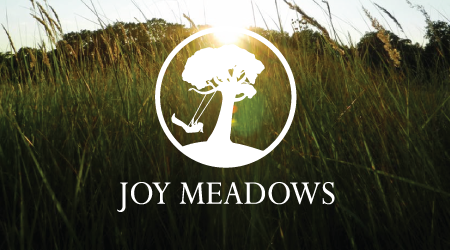 Become a monthly donor of Joy Meadows. Donate Now. Give a one-time gift. Click to Donate Now, or mail to Joy Meadows at P.O. Box 182, Basehor, KS 66007. To find out about other unique ways to give, please contact Sarah Oberndorfer at sarah@joymeadows.org.